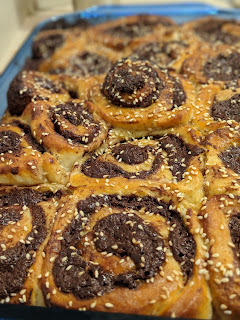 Sometimes I linger over a recipe, waiting for the right time to make it, and Deb at Smitten Kitchen's recipe for chocolate tahini challah buns has been one of those. Last December I made chocolate tahini cookies and thought they were delicious, so I was curious how that flavor combination would do in this challah bun configuration. 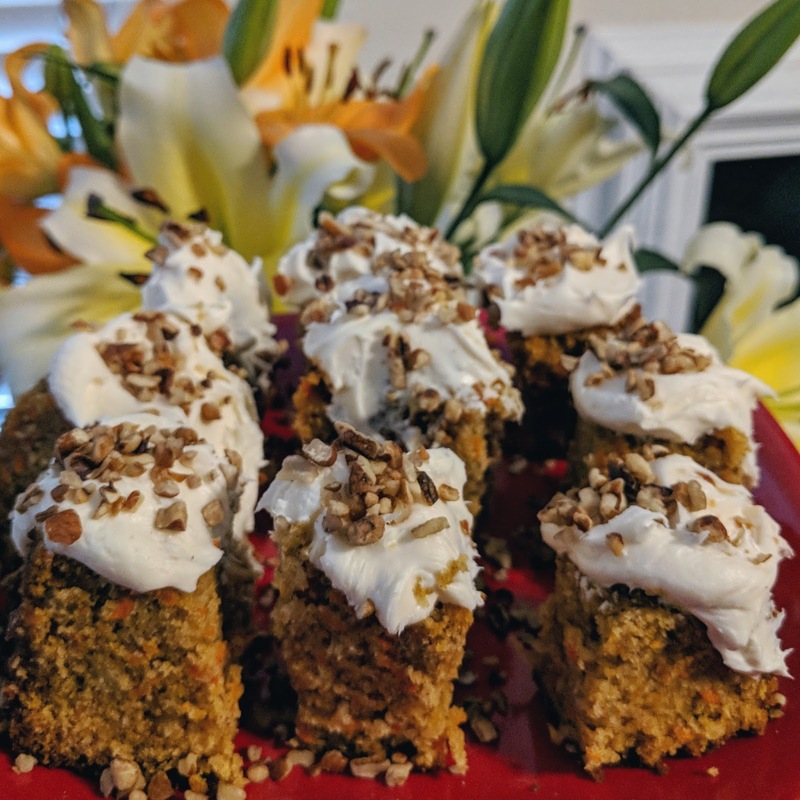 My husband and I eat low-sugar most of the time, and sometimes on holidays we overdo it on the sweet department and feel less than great for the holidays. So I was also interested because Deb mentions that the dough, being challah instead of cinnamon roll dough, is less rich, and that overall they are not super sweet. I decided this might be the perfect Thanksgiving breakfast for us, and also went light on the glaze. I liked these okay. I am a bit out of practice with yeast and feel like the dough wasn't as risen as I wanted it to be, but true to form for most Thanksgiving Eves I had waited longer than I intended to start them and I was impatient. I did go up through all the steps up to placing the cut rolls in the pan, and then stuck the pan covered in the fridge, already with egg wash. In the morning, it was Nathaniel's day to get up early with the dogs so he took the pan out and they sat around for an hour before I baked them. I used bittersweet chocolate because I had a bar of it leftover from a previous baking project that was exactly the right amount. I would say that the type of chocolate you choose will heavily influence whether or not the rolls are received as sweet or not; with bittersweet they really aren't very sweet at all. I did notice that the chocolate burns a bit cooking so long in the bun, and I'm not sure how to avoid that fate. 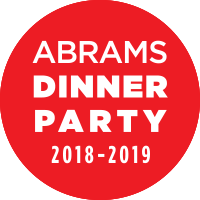 I'm going to copy and paste her recipe here, but only because I worry about it disappearing, and know it's okay to do so with a recipe based on USA copyright law. But this recipe is not mine, and you should buy her cookbooks, because she does a lot of recipe testing until a dish is right! And if you follow my many links to her recipe, you will see step by step directions. I have erased the metric measurements because some of the comments on her blog said they were incorrect, and she may update them, so check back there. Make dough: Whisk eggs, yolk, sugar, oil and milk or water in the bottom of a stand mixer bowl. Add flour, yeast and salt and combine with dough hook until it comes together, then let machine knead it for 5 to 7 minutes. Oil a large bowl and let dough rise in it at room temperature for 2 to 2 1/2 hours, until slightly shy of doubled. Were your ingredients really cold? This is fine, but if so, it might take 30 to 45 minutes longer. You can speed this process along by turning your oven on to 150 degrees F and turning it off and then placing bowl the dough inside. Keep an eye on it because it will rise more quickly. Make filling: Melt butter and chocolate together until smooth. Stir in powdered sugar, cocoa and tahini; mixture should be a spreadable consistency. [New note:] If your filling is thin, pop it in the fridge or freezer (if freezer, keep a very close eye on it) for a few minutes to let it thicken a bit. Just a brief note about the rest of our Thanksgiving meal - I made dishes that were lightly influenced by Native American recipes. 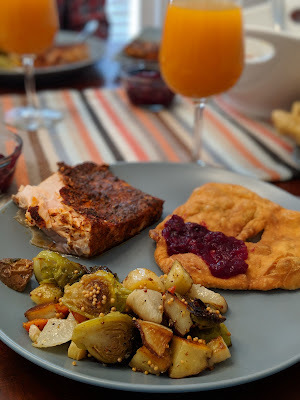 We had salmon with potlatch spices, roasted root vegetables with a mustard seed vinaigrette (from the Mitsitam cookbook), wajapi made from cranberries and blueberries, fry bread, and apricot juice. Many traditional cookbooks had "apricot drink" made from "field apricots" but I don't even really understand what those are! It was a delicious meal and not too heavy, just the two of us. 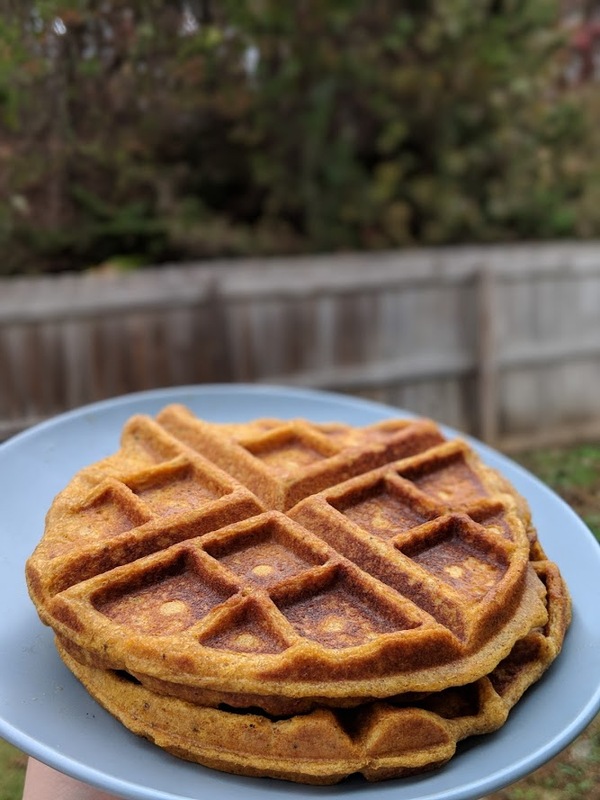 I looked at some protein waffles, paleo waffles, and various other pumpkin waffle recipes online and decided to make up my own. These were tasty and the morning after I made them, we all agreed we should have just made these pumpkin waffles again! Let's face it, even if you've been baking forever, and feel like you know how to properly grease a pan, sometimes a series of choices and events beyond your control will cause a delicious cake to refuse to release from a pan in one piece. 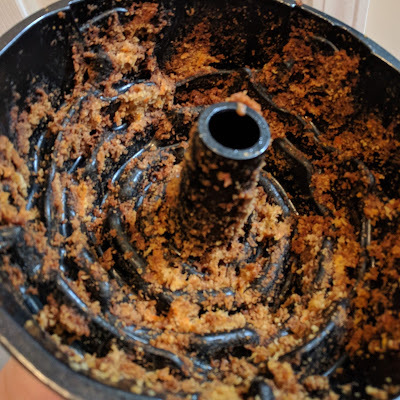 In my case, I started baking at 8, I didn't wait for the browned butter to cool, I hadn't properly greased the pan, and when I started to unmold it after it had cooled 10 minutes, it was not even budging an inch,. Here's the marvelous carrot cake from The Artful Baker, or rather, the pan after I finally got the majority of the cake out. Suffice to say, I did not salvage the cake in one servable chunk. I decided early on to make either a cake trifle or cake truffles but I was really short on time prior to the evening I had volunteered to bring dessert. So my first strategy was to cut the largest pieces down into mini cakes that were roughly the same size, put a dollop of cream cheese icing on each, and sprinkle on some pecans. The cake recipe was delicious so they were tasty, and after a filling meal, the little cake bites were a nice size. 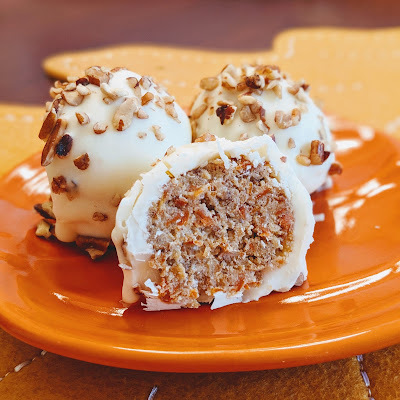 I still had the pieces I cut from these mini cakes and a bowl of crumbs salvaged from the inner workings of the rose pan, so with these I made a smaller batch of carrot cake truffles. This is easy, you just have to have time for the various stages to firm up. I'm going to put the official recipe below but real talk, I used canned frosting and Ghiradelli white chocolate melts and those were the only ingredients I bothered with. I had to cover a few of the truffles twice in order to stick pecans to them as the Ghiradelli melts reset incredibly quickly. These are overly sweet for my tastes, more white chocolate than carrot cake. But they may be to some people's tastes, so I will bring them to work with me and see what happens. But this strategy could work with any cake failure, with any flavor of icing and a chocolate candy coating. A former co-worker used to make delicious oreo truffles in a similar way and people loved them!